If you allow your pet to spend time indoors as well as outdoors, you probably let him out in one of two ways: by opening the door, or by installing a swinging pet door in one of your entrances so he can move freely. 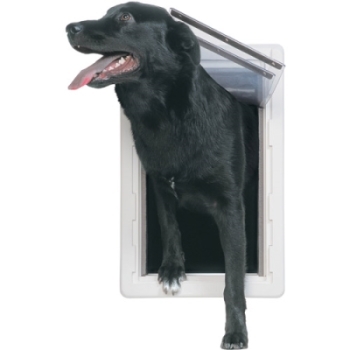 While letting your pup or kitty out manually allows you to know where they are at all times, busy pet owners may prefer a pet door. In addition to providing convenience, these special exists can help cut down on the amount of scratching pets do when asking to be let in. For those who prefer not to cut into their main doors, a pet entrance set into your garage door can make a great deal of sense and allow your furry friend to maintain his independent lifestyle. Can this be done without undermining the integrity of your garage door? Yes! We’ll show you how. 1. First, measure your pet: Measure your pet’s height from the bottom of his paw to the tip of his shoulder blade. Next, use masking tape to mark on the garage door how high the door will need to be cut. Measure the width of your pet from shoulder to shoulder. When purchasing a pet door, you will need to obtain one that measures the width of your pet plus 2 inches of space (wiggle room) on either side. Note that the time to install a garage door is when your pet is fully grown, to ensure that the entrance space accommodates his full capacity. 2. Measure the width of your garage door: Divide this measurement by two and mark the point directly in the center. Make a perpendicular line from the bottom of the garage door up to your pet’s height line. Next, use a pencil to make a perpendicular line over the masking tape marking this height. 3. Measure the width of your pet door and divide it by two, marking the center of the door in the same way you did with your larger door. 4. Align the mark you made on your garage door’s center with the center of your pet door. 5. Trace the shape of your pet door onto your garage door. 6. Use the drill with a ¼-inch bit to bore holes through the corners of the tracing you made on the garage door. Be sure to wear your safety goggles while doing so and keep the drill vertical, drilling completely through. 7. Remove the ¼-inch drill bit and replace it with the ⅜-drill bit. With this new bit, drill halfway through the door through the same hole. Turn the door over and enlarge the hole by drilling through the door’s other side. Finish the hole enlargement from the back side to avoid splintering the wood. 8. Next, use your jigsaw to cut out the door’s opening using the template lines you have already marked. 9. Adhere exterior caulking around all three sides of the opening for the pet door. Then, push the pet door frame into place and wipe away any excess caulking. Push the interior door frame into place and use a screwdriver to screw the door in securely. If no screws came with your pet door, use ¾-inch wood screws to install. 10. Finally, slide the interior security panel into place. This prevents your animal from using the door when you are away, or at night. This will also ensure that pests, like raccoons, mice, and other rodents, do not enter your garage. Pet doors are convenient ways to allow your beloved animals access to your home and property without having to constantly open and close the door. Installing a pet entrance in your garage door is safe and easy. However, if you have concerns about the installation process or do not want to cut into your garage door yourself, Ponderosa can help! Call us with any concerns and we’ll be over in a jiffy!